If you were assessing the chances of all of those artists who’d entrered the rock fray since its arrival in September 1947 as to which of them would be most likely to be hitmakers in this new field and which were destined to be also-rans, there’s not much doubt that few would’ve chosen Edgar Hayes as a candidate for stardom. By this time he was nearly fifty years old, a veteran jazz musician who might have indeed had some momentous recordings along the way but no verifiable commercial success or name recognition to really show for it. His fall off from a brief flurry of notable output in 1938 came rather quickly and he was reduced to playing clubs around California for virtually the entire decade of the 1940’s, a time when he should’ve been an aggressive competitor in the marketplace during the heyday of the type music he specialized in. Now, as a far more crude style of music came along in the late forties emphasizing flash over technique, heavy rhythms over subtle melodies, stripped down bands as opposed to larger ensembles, all of which was being aimed at a younger and more socially restless brand of listener who used this music as a form of self-esxpression, a badge of who they were and what they were after in the rapidly changing world, Edgar Hayes seemed to be somebody who was destined to be left behind. As if he hadn’t already been left behind already. But maybe it was a sense of simmering resentment over being cast aside in jazz, not having a record deal for years despite being the guy who recorded In The Mood before anyone else, or maybe he was just a contrarian by nature who took particular pleasure in defying people’s expectations, but when Hayes finally got another chance to cut records in late 1948 he didn’t do so as a jazz artist, he did so as a rock act. And a damn GOOD rock act at that. Not just veering towards the hallmarks of the style unintentionally, or maybe doing it once as a lark or under pressure from a record company… no, Hayes did it fully aware of what he was getting into and thus far if you let the results speak for themselves he was having the time of his life bucking convention. It should go without saying that musicians are creative people by nature. They aren’t building houses where you follow a blueprint, they aren’t surgeons cutting on the dotted line. They’re artists seeking to make something out of nothing, or at least nothing that has any rules that can’t be broken. So while there are many who are devoted to one specific genre and all it entails, others are unwilling to be confined for eternity to following just one musical path. Those who blatantly genre hop, abruptly leaving behind one type of music in hopes of conquoring another, may be rarely accepted in their second stylistic pursuit, but Hayes was one of the exceptions as he wound up finding his greatest reception only after making the move to rock. Joining Hayes on this cockeyed endeavor to reinvent themselves in the new frontiers of rock ‘n’ roll was guitarist Teddy Bunn, another visionary from the past – as an acoustic picker in the thirties turned electric guitar pioneer in the early 1940’s – who gave the oddly named “Stardusters” a very eclectic sound. Their past was steeped in jazz of course, but they’d played more rudimentary styles as well, particularly Bunn in washboard groups, and the latter was also conversant in blues which had taken the lead in terms of its reliance on the guitar as of late. Yet they played with a stylistic freedom that simply refused to acknowledge genre borders, their arrangements taking liberally from anything and everything they could think of and they mixed all of these sources together with surprising compatibility. Equally surprising, if not more so, was the commercial reception as their initial foray – Fat Meat ‘N’ Greens made Billboard’s national charts while doing even better on Cash Box’s more precise regional listings where it nearly topped the charts in various cities during its long run as a best seller throughout the winter and spring. It then was joined on many of those regional charts by Sunday Mornin’ Blues, which spent two months in summer in the Top Ten in Chicago and almost as long in Los Angeles, proving their initial success in this field was no fluke. Considering they had no real name recognition to draw from, no big record label promoting them, and were a West Coast group on a West Coast label who were suddenly scoring hits in the Midwest and East, this had to rank as one of the more unlikely developments in rock thus far. Proof that the music’s allure in of itself was more than enough to overcome the traditional obstacles of exposure and artist familiarity with listeners who craved these sounds. 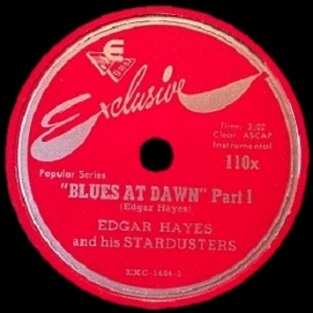 Now Hayes goes three for three in terms of hit releases, as Blues At Dawn made the national Billboard charts with a two part instrumental that covers about as much ground as possible and yet still comes away with a coherent performance that only bolsters his reputation as one of the more underrated figures of 1949, both commercially and artistically. Two part songs are still a rarity in rock at this stage, with this being just the fourth of its kind after two records by Sonny Thompson and one by Paul Williams… all of which, it should be added, are instrumentals. But rather than an instrumental that is merely one extended piece stretched over two parts because it was so mesmerizing they didn’t want the groove to stop, Blues At Dawn is something else entirely. It’s in effect the SAME song reflected in a mirror, giving listeners two distinct versions of the same idea. On the surface the concept is similar to Thompson with Long Gone, wherein he created two separate songs from the same idea, just switching out parts for different instruments when on Part Two they added Eddie Chamblee’s saxophone to carry the same riff. But what Hayes does here might be even more inventive because on Blues At Dawn Part One he’s playing the meat of the song on piano with Teddy Bunn’s guitar accenting it. On Part Two they switch places entirely as Bunn plays the same basic thing as Hayes did but on an instrument that sounds radically different, thereby causing the two sides of the record to sound like night and day. This type of thing WAS a bandstand feature in jazz it must be stated. Sort of a “stump the musicians” game wherein somebody in the band would play a lick and the others, be it pianist, guitarist or sax player, would have to mimic it the best they could, not just hitting the right notes but with the same technique, something that wasn’t altogether easy for instruments that couldn’t slur their notes like one of their bandmates could. Here of course they aren’t doing that. It’s not a back and forth exchange one instrument is having with another, but the concept at least is similar, just spread over two sides of the record, each one taking the lead for one side and seeing how close they can come to replicating each other. It’s not a note for note imitation even, just a fairly close approximation. Part One finds Hayes in the forefront on piano, his stabbing intro which soon gets shadowed by Bunn on guitar who then fades to the background while Hayes sets the pace and delivers a somewhat stark melody for Bunn to add accents to. Hayes is certainly busy, his right hand never slackening off, slipping and sliding on the keys, bearing down and easing off nicely before the saxophone lends a hand with a solid solo that is just a little bit sultry to keep you locked in. He too ramps up his intensity at times, something which obviously keeps it more aligned with their current job description as rockers. Even Billboard magazine, hardly a publication that was cognizant of the black musical trends of the day, said of Hayes in their review: “propels a moving rocking beat that builds thru two fine sides”. Indeed Hayes dominates the last half of Part One in particular and undoubtedly that was a prime reason why this did as well as it did on the charts. By contrast Part Two is a showcase for Teddy Bunn who only made his presence known in brief flashes the first of the record. Not so here where he takes the lead throughout, a prancing backdrop laid down by piano and drums quickly joined by Bunn’s stealthy single string runs which sounds like somebody lurking about a dark alley looking for a window to slip through to lift whatever was left laying around. What’s most alluring here are the sheer possibilities presented by the electric guitar for a broad range of sonic expression. We’ve gone into how the guitar went from a little used side piece in rock, there to keep time unobtrusively while maybe adding a lick or two just for flavor, and how gradually – very gradually, as in over the course of nearly a decade – it began to be used more and more to take center stage in arrangements. All of the reasons for this – the transition from acoustic to electric guitar just a decade before this meant that most of your better musicians of this era had gravitated towards other instruments growing up which had provided more options for them to explore. Even after the electric solid body guitar became available there was still the problem with having it heard over the din of a crowd using bad amplifiers and shoddy sound systems in sub-par clubs, something bands didn’t have to worry about as much with pianos, horns and drums. But now that the up and coming generation had grown up with the electric guitar more and more bands would have to find a place for it and once entrenched in the lineup it’d quickly take over. Bunn wasn’t OF this current generation coming of age of course, he was one of the forerunners who’d started on acoustic and made the switch and found himself ironically with less to do once that switch was made. So for him rock ‘n’ roll, with its more wide-open arrangements provided a platform for him to experiment and so hearing him stretch out on Blues At Dawn is a treat. He takes the opportunity presented to highlight virtually every sound he can think of, from harsh chording backed by the emphatic drums, to light finger-picking. He shifts tones effortlessly, draws out certain notes and lets others linger in your consciousness. When the sax comes in mid-way through starting with a mellow ambiance before stepping on the gas and unleashing some bloodcurdling wails as Bunn prods him from the sidelines, the song takes off even as it has long since lost any hope of leaving a distinct melodic impression on you and is clearly settling for a mixture of mood setter and performance art rather than something you’ll actually be following along to, or for that matter getting down to on the dance floor. For that reason Blues At Dawn occupies a rather unusual place here, a good record that features some terrific musicianship, yet it’s a record that probably is more apt to be admired from afar than it is to be really enjoyed in the moment. As something playing in a club as you scope the scene out, looking for a potential score of some kind, this is hard to beat, laying down an atmosphere that immerses you. 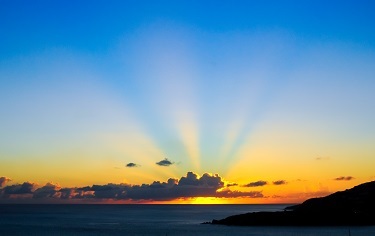 But if you’d already made your connection, whatever that connection might be, romantic, narcotic, business or pleasure, and were thus able to sit back and focus on it more closely the appeal might become a bit more elusive. You don’t have to be a musician to appreciate it by any means but it probably makes it a lot easier to do so. For THESE musicians it was another measure of validation for their skills and for their decision to venture into uncharted waters looking to make their mark. Unlikely though their continued success in this field may have seemed on the surface it’s kind of hard to dispute that when it came to playing music, ANY kind of music, these guys knew what they were doing and was proof that while rock got its most of its acclaim from the work of the new breed artists just coming into their own, there was still a very important role the elder statesman played in showing everybody the possibilities that existed if they chose to stretch out. 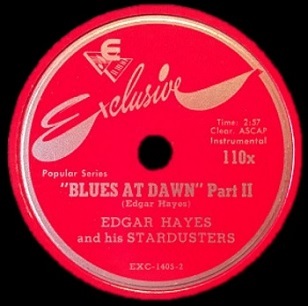 Leave a reply on "Edgar Hayes & His Stardusters: “Blues At Dawn”"